Do you love to go camping? Maybe you went as a child and young adult and you can’t wait to share the experience with your own children. That is exactly how I was. I have amazing memories of camping as a child, super FUN, PARTY memories of camping with friends and now camping memories with my own family. But, there is a bit of a learning curve when camping with kids. Once you have picked where you are going to go camping, here are my 5 tips for setting up when camping with kids. Wait, I forgot something super important! If you want to start the camping trip off on the right foot, make a decision with the adults present (i.e my husband) who will do what jobs. Also, decide are the kids helping or it easier for them to take a short stroll (if this works for the age of your children) while you set up? You will avoid a lot of arguments if you discuss this first (speaking from experience…). If you go camping with young children, you will NEED a bathroom close by. It can be super annoying to have to walk back and forth to the bathroom multiple times per day. You know the drill – child #1 has to go to the bathroom. You walk he/she there and back to the campsite. When you return child #2 announces that he/she has to go to the bathroom. By choosing a campsite closer to the bathroom, you avoid a lot of steps and frustration. If you are camping in the wilderness, make sure you pick a spot away from your campsite to prepare for toileting. You need to bury your business so that you don’t attract animals or ruin the experience for everyone else. Plan as many meals as you can that require minimal cooking. Decide where you want to set up your cooking station. If there is a grill at the campsite, take advantage and bring charcoal to cook. If you bring your own cookstove or are using your camper to cook, think of meals that require minimal cooking effort i.e. oatmeal (boil water), individual noodle soups (boil water), pasta (boil water), etc. Obviously, make sure you are cooking away from anything flammable. This might seem obvious but I have seen quite a few campsite fires through the years. When it rains, people are quick to cook under tarps which is not always safe. Depending upon the wildlife at the campsite, you will need to make sure your food is stored safely. The last thing you want is a bear getting your food or ripping apart your garbage. It isn’t just about losing your food or the animals making a mess, it could be about running into aggressive, hungry wildlife. No thank you! Use airtight containers (I can’t stand the thought of mice). Hang up garbage if necessary. Put food in the car overnight depending upon the risk. My #4 Tip: Make sure you set up a first aid kit. My #5 Tip: Check the campground rules. It is helpful to know the campground rules for several reasons. Do they allow dogs? Do you need rabies paperwork or other documentation for your dog? Side note: One time we went camping with the family, and we didn’t know that the campground did not allow dogs. Guess what we had a dog with us! We were an 8-hour drive away from home and couldn’t turn around obviously. My sister worked a deal with the campground owner that the dog would not go into the cabin and would sleep outdoors or in the car. It was horrible for my sister though. So do your diligence and check on pet rules before you leave the house. 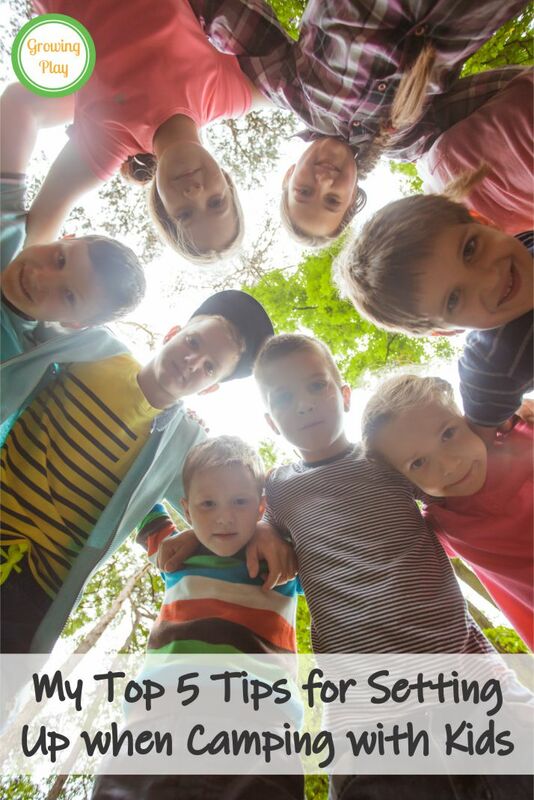 Check on general rules such as what time do the kids need to back on the campsite? What are the quiet hours? When camping with the kids, you appreciate quiet hours at night so you want to respect them so other people do the same. My BONUS tip: Set up a container with rainy day fun. Unless you want to go crazy as a parent or start drinking at 10:00 am, make sure you set up a container with rainy day fun. I like to include a deck of cards, small games, coloring pages, activity books and other items to keep the kids entertained if bad weather arrives or they are just plain tired. Check out my suggestions for the 6 best games to bring camping. Add some FREE camping journal paper to the container. 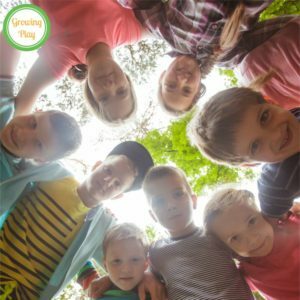 What is your top tip for setting up when camping with kids? 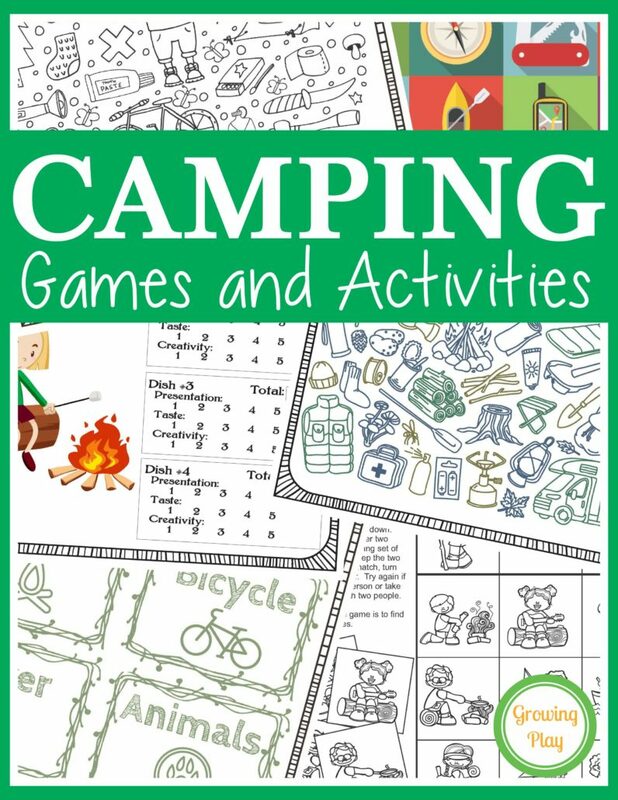 Camping Games and Activities – includes 25 fun puzzles, mazes, and games to play while on a camping trip or anytime! 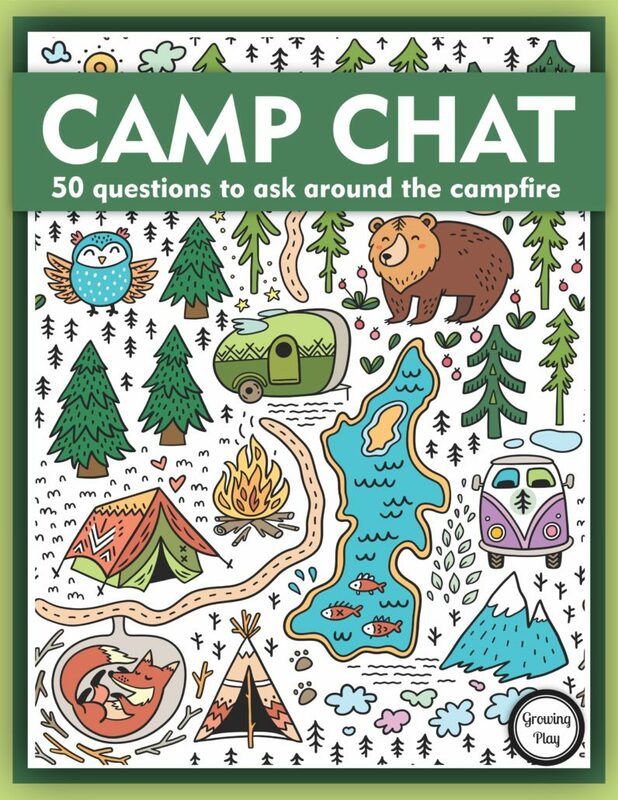 Camp Chat – get the conversation going with questions about camping, the outdoors, memories and more! You will learn so many new things about everyone sitting around the campfire.